this property was selected as its in the heart of true Coral Bay on a peaceful cul de sac yet walking distance to coral bay beach and the main centre of Coral Bay with all its bars shops and restaurants,its ideal for couples wanting a peaceful break or a family with children being fully enclosed and the pool having roman steps. all bed linen provided, beds made prior to arrival and mid let linen change on all stays of 14 nights. fire place with working real fire. two living rooms, first with the real fireplace large comfy settee and chairs, next open plan room has a large flat screen tv and settees leading to kitchen area, both lounges have patio doors. first floor balcony to front from the master offering bay views, patio doors to the rear to shared balcony with bedroom 2 facing the pool. lovely covered outside dining and lounge terrace, table and chairs for 6 for dining and large settee and tow chairs for lounging, perfect for resting from the mid day sun. these can be hired from Coral each or excellent diving from the local Coral Bay divers. skiing in Troodos mountains 1 and half hours away, Jan/Feb. lovely 8m by 4m private pool, offering wide roman steps for ease of access or just sitting on. An excellent appointed villa in a super quiet location, walking distance to all amenities. We spent two and half weeks at Bay View villa, which we thougherly enjoyed. Lisa was attentive and very accommodating. We arrived late evening and the welcome pack, consisting of milk, ham, bread, eater & water was very welcome. The information was invaluable and a nice touch was the personal letter left by Lisa. Losa was very accommodating when it came to the time we were leaving and let us stay in the villa till 4pm. The villa had everything and the fixture and fittings were all new and well appointed. The location was fantastic, with a leisurely ten minute walk to Coral Bay and the same to the beach. It was tucked away down a private cul-de-sac, so no traffic noise or loud music. The local bar The Frog & Toad was just a five minute walk and was most welcome for an early morning breakfast or evening nightcap! We have been to a lot of private villas over the years for our summer holidays and I can honestly say this villa is right up there for quality and location. So, if you’re looking for a villa in Coral Bay and you want top quality in a quiet location, this is the place! You won’t be disappointed. As soon as we arrived at the Villa we loved the place. 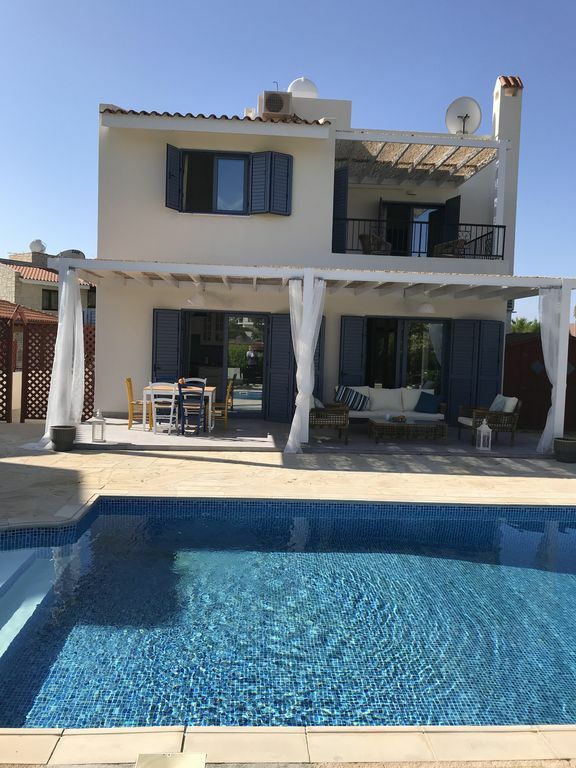 Its decorated and fitted out to a very high standard the kitchen is full of top quality appliances, the furnishings and beds are smart and very comfortable, the Air con is ice cold and in every part of the Villa. Outside the garden in a wonderful space to rest and relax next to the very clean and well kept pool, there is also some extra rattan furniture perfect for the beautiful evenings as you enjoy a glass of wine. The location is also superb on a quiet road but with Coral Bay town and the beaches in easy walking distance. Lisa and Feliz were a pleasure to deal with and answered any questions swiftly. All in all we had a fantastic holiday and will be booking again for next year. Many thanks to Lisa and Felix, will see you next year. thank you so much for taking the time to write a lovely review. we are so glad you loved our villa inside and out, so much attention to detail has been given to the refurbishment and its lovely to hear you love it as much as we do! The villa was really nice, decorated too a high standard without. The welcome pack was a great and was welcomed after a long day. The villa was relaxing and inviting and had everything you needed for our holiday, the only thing that let it down was that the pool was never cleaned in the 2 weeks stayed, even though it was stated in the villa information that it would be cleaned at least twice a week, the pool man did turn up twice did a test on the water and added chemicals but the bottom of the pool was never cleaned, by the end of the 2 weeks the water was murky with lots of grit and bugs in the pool, we had to use the pool net to get the bugs out every day for at least 30 mins a day. we are so glad you had a lovely stay and thought the villa was great and had everything you need for your holiday. I have to point out unless you are up between 5am or 6am you probably wont see the guy who vacs the pool, he comes early due to the heat, it was Felix who you met several times who was checking the chemicals and adding etc as this is must be done by a fully qualified pool technician, the guy literally just vacs and nets. all villas have a net and pole as leaves etc will land in a pool constantly. this is so guests can net their pools, most are quite happy to do this as even if a pool man came every morning you would have things in by the afternoon especially with the winds we have had and the villa being surrounded by hedging and trees. the day before you left Felix was chatting to your husband whilst he was in the pool which was crystal clear so we know there are no pool problems and its kept to the highest standard. we are so glad the holiday was everything you hoped for and more. we are very pleased with the refurbishment. I too love the way the patio doors open onto the wonderful pool area with dining and lunging furniture. its great for future guests to read about the standards, how well equipped it is and layout. A great experience from the minute we booked. Lisa was in contact within the hour and we were all booked up in no time at all. Very responsive even in the run up to our holiday and extremely helpful. The villa was perfectly located, less than 10 minutes walk to two beaches and the main strip for evenings out. We spent a number of days pool side with a pool bigger enough for adults and children, our son swam most days in the pool and nearly turned into a fish. The villa was perfectly equipped as you would expect, even a decent hairdryer which saved on space in our luggage. The beaches are clean with plenty of sun beds. The sea was shallow which meant we could allow our 8 year old son to play in the surf under our watchful eye just 10 metres away. We took a boat trip along the coast from Paphos up to Lara Bay for a dip and then again at Coral Bay (Wave Dancer 1), the tour company even picked up from the strip, highly recommend this all inclusive trip. The bus to Paphos was easy and only 20 minutes at 1.50 Euros one way. I would highly recommend this villa for anyone looking for a comfortable and enjoyable holiday. We would book again. Die Ferienvilla ist sehr schön eingerichtet und liegt in einer angenehmen Gegend. Ein umfangreiches Willkommenspaket mit allem, was wir bräuchten, erleichterte uns das Ankommen sehr. Die Kommunikation mit Lisa und Felix funktionierte hervorragend. Einige kleine Mängel wurden sofort behoben. Wir bekamen eine neue Pfanne, einen Spiegel, vor dem wir die Haare föhnen konnten und die Dusche wurde mit einem Klebeband funktionsfähig gemacht. Die Austattung der Küche war eher knapp und sie hätte auch sauberer sein können. Der Grill für draußen war leider völlig durchgerostet und nicht benutzbar. Insgesamt haben wir drei wunderschöne Wochen in der Ferienvilla verlebt.